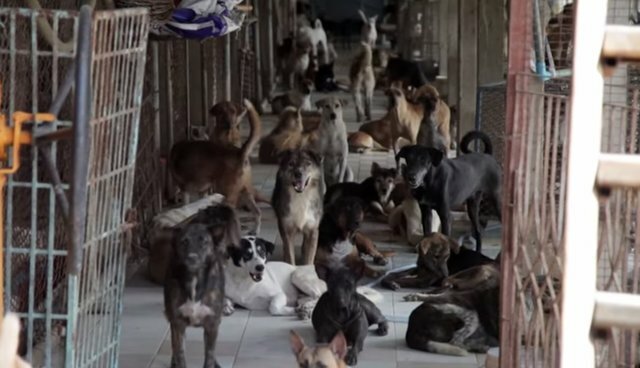 1,500 Dogs Struggling To Survive At Thailand's "Dog Condo"
In a dilapidated complex on the outer edges of Bangkok, Thailand, dogs can be seen wandering in and out of swamps and mud pits, caged in small enclosures and roaming the streets. But, believe it or not, this "Dog Condo" is better than it was just a few years ago, thanks to the tiny group of workers and volunteers who are fighting to lift the animals out of the swamp. The country's most populated city, Bangkok has some 300,000 stray dogs, according to local NGOs. Built in 2003 on the grounds of an old temple, the place was originally meant to house the dogs and cats who were rounded up by workers in Bangkok, instead of exterminating them. In 2013, the Asian news website Coconuts published a feature on the "condo," revealing a horrific scene of deplorable and unsanitary living conditions. The wall-less second floor of the building is festooned with steel cages-pinks, blues, grays-suspended over the edge offering little comfort to the dogs and cats crammed inside (sometimes together), nervously aware of what lies below. For visitors on the ground, a 'Beware of falling fluids' notice would be appropriate, but this place is in such a state that any discussion of warning signs is simply laughable. Dogs sometimes scavenge below and eat the fallen feces. The entire facility is run by just two main employees, Sunnee 'Lek' Sukkaew and Pataew 'Taew' Wanitsuto, who earn meager wages and care for hundreds of animals every day. After the expose, Society for the Prevention of Cruelty to Animals International (SPCAI) teamed up with the Phuket-based Soi Dog Foundation for a massive cleanup effort. Now, Byron Perry, managing director of Coconuts, has returned to the Dog Condo to check out the progress. While things are improving, is still far from perfect. "The dogs at the Dog Condo are mainly abandoned pets dropped off by their owners or rounded up strays from throughout Bangkok," Perry told The Dodo. "The people who work at the Dog Condo are actively trying to spay and neuter all of the animals there, and I think nearly most are." While cleanup efforts continue, the Dog Condo is still struggling to feed its hundreds of dogs and cats every day. See the SPCAI, PAWS Bangkok and the Soi Dog Foundation for ways to help care for these animals.